Lending a hand, nurturing a community. Caring for each other through loving acts big and small. “Random acts of kindness” are well and good, but at Our Redeemer’s we approach caring as an active and ongoing commitment. Year-round, our Caring Community team provides the extra help, companionship and blessings most of us look for at some point in our lives. They reach out to members and friends who are homebound, ill, welcoming a new child or simply in need of an extra hand. People of all ages are invited to share their time, energy, prayers and companionship with others in our community. If you’d like to get involved in these not-so-random acts of kindness, contact Julie Vannoy, a leader of our Caring Community team. Keep reading more about our Caring Community programs. Help us weave a community of support. For those who are hospitalized, grieving or welcoming a baby, our Sunshine Ministry is a caring resource for meals, cards and community support. Members of the Sunshine Ministry make sure each person in need of a blessing is included in our weekly prayer list so that we can keep them in our minds and hearts. A monthly visit with someone from the church becomes more than a chance to receive communion: it’s a meaningful way for our members to stay connected with our community when they are unable to attend worship. Most often, over time, an Emmaus visitor becomes a friend. Both parties are blessed by the opportunity to listen, laugh and share with one another. If you would like to be an Emmaus visitor, simple training is available. If you would like to participate or receive an Emmaus visitor, contact Linda for more information. The prayer list is included in every Sunday bulletin. All members of our community can request prayers for themselves or others. The Prayer Chain is a group that prays daily for those on the list, and even for specific outcomes and details. If you have a prayer or want to join the chain, please get in touch to learn more. The holidays offer ways for people of all ages to reach out to and celebrate with our homebound and hospitalized members. Caroling is usually the first two Sundays of Advent; poinsettias and lilies are delivered after the Christmas and Easter services. Blue Christmas is usually held near the winter solstice, when the daylight is shortest and the night longest. This service offers a quieter alternative for community members experiencing loss, depression or other challenges that can make the holidays a difficult time. Blue Christmas focuses not on the “holly jolly” side of Christmas but on the hope and comfort of Christ’s coming. 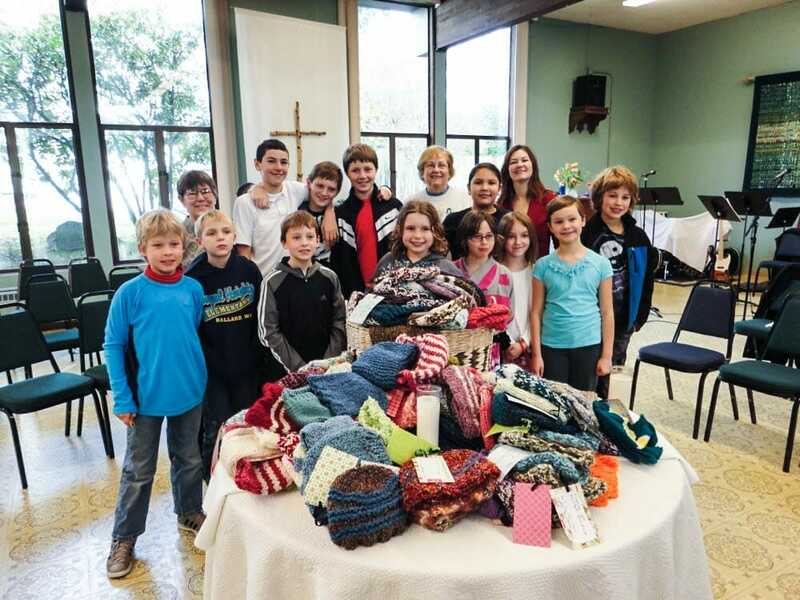 The members of this group knit special prayer shawls and baby blankets for members of our community. These lovingly prepared gifts are blessed by the congregation and delivered to those in need of support and embrace. Prayer Shawl Blessing: May the one who receives this shawl be cradled in hope, kept in joy, graced with peace and wrapped in love. On this date, and around our gathered circle, this shawl has passed through our praying hands and been blessed by our loving hearts. Care Notes are short booklets containing helpful insights on the spiritual issues that can accompany painful events in life. Topics such as “When prayer is not answered” and “The first year after your loved one’s death” offer accessible perspectives on real-life questions. You can pick up a Care Note in the wall racks near the church entrances. If you have five minutes, you have time to take in a Bible verse, a thought and a simple prayer. Taking home a devotional booklet is one way to add a moment of quiet learning and reflection to your everyday routine. Devotional booklets are also available in larger print. Welcoming Wisdom is an August luncheon that honors and celebrates the older members of our congregation. There’s always music, laughter and an opportunity to exchange meaningful insights on community, faith and a wide range of life experiences. Questions about your medical diagnosis? Nurse practitioners and nurses in the congregation can help you understand your diagnosis, interpret medical jargon and can often offer knowledgeable support when treatments are extensive. If you need transportation to church or to the doctor, contact Julie Vannoy, a leader of our Caring Community team. We can usually arrange for a member of the congregation to give you a ride.